One of the concerns we have with novel influenza viruses – those that primarily infect non-human species – is that when they do jump to humans, they may occasionally encounter and interact with human influenza viruses, and produce a more `humanized’ hybrid virus. A reassortant virus, with genes from both parental subtypes. We know this can happen in the wild, as reassortment is the route by which many new subtypes of influenza are created. It is how the H5N1 virus evolved in the 1990s, and how H7N9 abruptly appeared in the spring of 2013. In 2014, we’ve seen three additional reassortments of concern; H5N6, H5N8, and H10N8. We’ve also seen this process (albeit, rarely) in humans . In 2011 an influenza co-infection in Canada led to the creation of a unique hybrid reassorted virus (see Webinar: pH1N1 – H3N2 A Novel Influenza Reassortment). In that case, the patient was a 16-month old boy from the Greater Toronto Area who was admitted briefly to a local hospital for respiratory and gastrointestinal symptoms in January of 2011. In the summer of 2013, in the Lancet: Coinfection With H7N9 & H3N2, we saw the first evidence of co-infection with the newly emerged H7N9 virus and a seasonal flu virus i a human. The case involved a 15-year-old boy from China - while two influenza viruses were isolated from the same patient - no reassorted virus was detected. Today, we’ve a Letter in the CDC’s EID journal that documents human co-infection between H7N9 and the other two parts of our seasonal flu triad; H1N1pdm09 and Influenza B. Since reassortment between Influenza A and Influenza B has never, to my knowledge, been documented - it is of considerably less concern than co-infections with novel and seasonal influenza A strains. 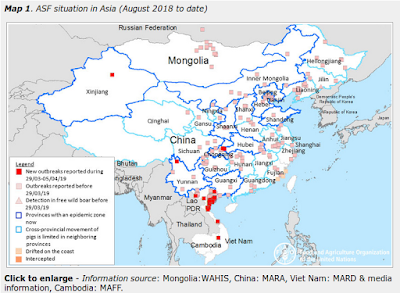 With H7N9 expected to return to China this winter, coincident with the winter surge of seasonal influenza strains, opportunities once more arise for human co-infections to occur. Additional reassortants could also take place in avian species, and while pigs have not been a major player with the H7N9 virus to date, they do carry a variety of influenza viruses, and could also potentially serve as a `mixing vessel’ for flu as well. While only a small percentage of co-infections (regardless of host species) are apt to produce a reassortant virus, and an even smaller percentage of that group would produce a `biologically fit’ virus, the odds of seeing a `humanized hybrid’ emerge and begin to spread may be low – they are not zero. The more opportunities that are afforded to influenza viruses to co-infect a host, the greater the chances of seeing a reassortment. All of which making control measures against the spread of H7N9 – or any other novel virus – of great importance. Here are some excerpts from this latest study. Follow the link to read it in its entirety. To the Editor: In April 2013, a case of co-infection with avian-origin influenza A(H7N9) virus and seasonal influenza A(H3N2) virus was reported in Jiangsu Province, China (1). This case raised concern over the possible occurrence of new reassortants with enhanced transmissibility among humans. Because of the nature of the dynamic reassortment of A(H7N9) virus with A(H9N2) virus in the environment and in poultry (2,3), close surveillance for possible new reassortment in human patients with A(H7N9) infection is needed. We report co-infection in 2 patients in Hangzhou, the capital Zhejiang Province, China, in January 2014. The co-infections involved influenza A(H7N9) virus and a seasonal A(H1N1)pdm09 virus (1 patient) or a seasonal influenza B virus (1 patient). Of 60 patients with laboratory-confirmed influenza A(H7N9) infections in Hangzhou in April 2013 and in January–February 2014, testing of pharyngeal swab samples indicated that 2 patients were also positive for seasonal influenza virus. The pharyngeal samples were tested by real-time reverse transcription PCR according to protocols provided by the Chinese National Influenza Center. Informed consent for this study was provided by each patient’s spouse. On January 6, 2014, patient 1 (male, 58 years of age), a resident of Xiaoshan District, had a high fever (39.6°C) and a cough; at a hospital, he received a diagnosis of severe acute interstitial pneumonia. The patient had a history of chronic myelogenous leukemia; his history of exposure to live poultry was not clear. On January 13, infection with influenza A(H7N9) virus was laboratory confirmed; viral RNA from a pharyngeal swab sample collected before oseltamivir treatment was positive for the following: influenza A virus (cycle threshold [Ct] = 26), H7 (Ct = 27), N9 (Ct = 26), influenza A(H1N1)pdm09 virus H1 (Ct = 30), and N1 (Ct = 30). The 2 viruses were named A/Hangzhou/10–1/2014(H7N9) and A/Hangzhou/10–2/2014(H1N1)pdm09. The patient received oseltamivir while in the hospital but died on January 18. On January 5, patient 2 (male, 54 years of age), also from Xiaoshan District, had fever and a cough; at a hospital, he received a diagnosis of severe acute pneumonia. He had a history of aplastic anemia and had been exposed to live poultry 1 week before symptom onset. On January 18, infection with influenza A(H7N9) virus was laboratory confirmed. Viral RNA from a pharyngeal swab sample collected before oseltamivir treatment was positive for the following: influenza A virus (Ct = 22), H7 (Ct = 23), N9 (Ct = 22), and influenza B virus (Ct = 22). The viruses were named A/Hangzhou/17–1/2014(H7N9) and B/Hangzhou/17–2/2014. This patient received oseltamivir but died on January 22. Taken together with the previous finding of human co-infection with A(H7N9) virus and A(H3N2) virus (1), our results show that human co-infection with A(H7N9) virus and each of the 3 seasonal influenza viruses currently circulating worldwide can occur. Avian influenza viruses, including A(H7N9), preferentially replicate in the lower respiratory tract of humans (8,9). In contrast, seasonal influenza viruses preferentially infect the upper respiratory tract of humans (10). Coexistence of A(H7N9) virus with either A(H1N1)pdm09 virus or influenza B virus in the pharyngeal swab samples from 2 patients suggests that the upper respiratory tract could provide a location for the A(H7N9) virus to reassort with other influenza viruses. The possibility that seasonal influenza viruses might provide some gene segments that increase the human-to-human transmissibility of possible new reassortants is cause for concern. For detection of such new influenza virus reassortants, extensive surveillance to identify influenza virus co-infections is necessary.